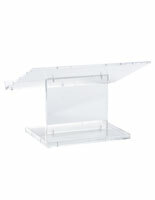 Tabletop lecterns are ideal for any location where space is inadequate. 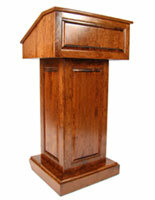 These desktop podiums are commonly used at impromptu press conferences as well as company events. For these applications, it doesn't always make sense to set up a full sized stand. 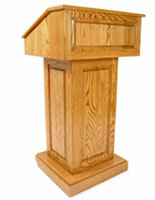 Other times a tabletop lectern might be used if both the audience and speakers will remain seated for the duration. 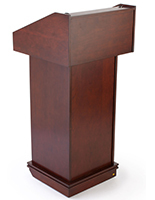 Interviews and informal meetings have a long history with desktop podiums. 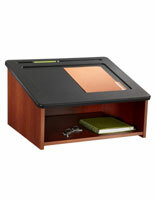 Governments at all levels, from local to national, often set up countertop pulpits to hold hearings or pass legislation. There are so many applications for the desktop podiums that they can't all be listed here. 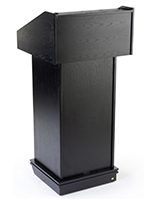 Examine the various options to understand which tabletop lectern is right for your event. 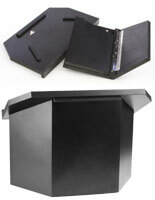 Consider all the facets of each countertop podium, like functionality, material, color, price, and shipping cost. 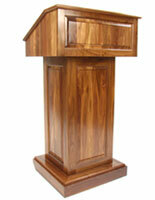 At Podiums2go, we strive to offer customers the best selection with the added benefit of wholesale pricing! 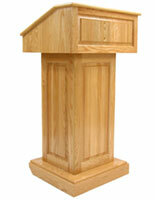 What are some of the reasons customers opt for a tabletop lectern rather than another design? 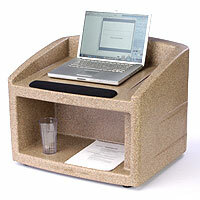 One of the main advantages of a desktop podium is the compact size. The smaller dimensions and lighter weight are much more manageable for users when transporting to events. Customers also benefit from cheaper shipping due to the smaller size. Some of the fully assembled floor stands must be shipped via freight or other ways that can cost a bit more. 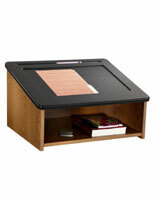 The compact lecterns for countertop use are the perfect money savers, yet they don't sacrifice functionality. 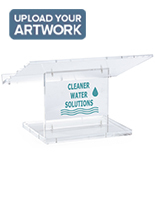 Tabletop podiums made of clear acrylic provide very modern look. The transparency is cool because there is nothing obstructing an audience's view of the speaker. These clear designs require a little bit of assembly. The process is simple and takes only a few minutes. 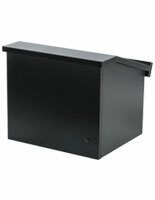 Just use the 8 included screws to attach the reading surface to the mid-section and mid-section to the base. Then you are ready to present. Wooden units are also quite popular but feature a more traditional look. There are several different finishes available. Customers can choose from multiple stain options, including light, medium, and dark oaks. 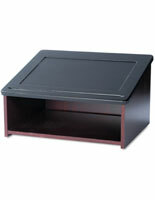 There are also red mahogany, cherry, and walnut options as well as black. 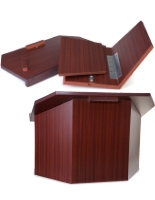 It is important to note that some of our countertop pulpits are made from solid wood, while others are crafted from a man-made wood composite, such as medium-density fiberboard. Each style is priced accordingly. Be sure to look at the differences between them to find the ideal model. 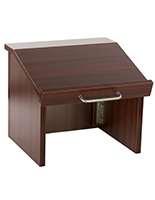 Some of the plastic podiums for tabletop use are similar to the wooden models because they feature wood-grain patterned panels that are inserted on the front. This way, the boring look of plastic is accented with a wood-like appearance. Of course, the faux wood panels aren't the only reasons to by these models; they are made for outdoor use! 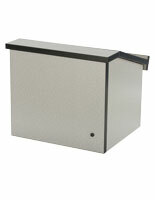 The plastic is very durable, weather-resistant, and is even made from recycled material. These models have been tested under extreme circumstances, including dead drops from multiple stories! 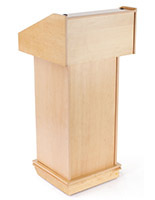 Available in black or beige, the durable lecterns will look great when providing long-lasting performance. Go green with these USA-made, recycled designs and impress everyone! 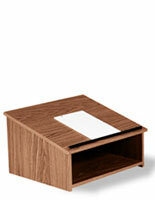 Pulpits that can convert from full height to tabletop are just so convenient and smart that everyone should get one! Essentially, you are getting two lecterns for the price of one. And with such appealing finishes, you will never be disappointed you spent a little extra to get the best. 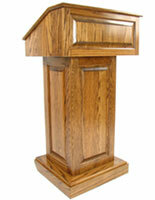 To convert these podiums just disconnect the reading surface from the mid-section and place the top on a table. 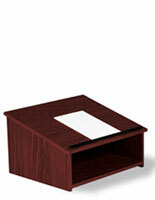 Our tabletop collection is one of the most diverse lines we carry. As illustrated above there are several different styles as well as materials to choose from. Making the right selection for your application depends on the nature of your business, the size of your events, the frequency of use, and other factors. It is easy to rush into a choice, but we always recommend that our customers take the time to really consider the best options.